The ō-yoroi, oo-yoroi (大鎧) is a prominent example of early Japanese armor worn by the samurai class of feudal Japan. The term ō-yoroi means "great armor." 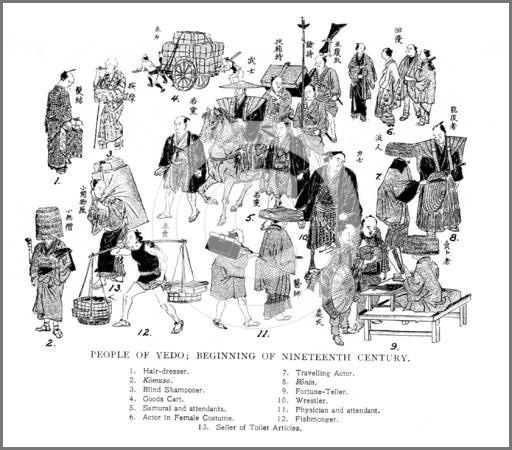 Ō-yoroi first started to appear in the 10th century during the middle and late Heian period, and came into widespread use in the Genpei War around the 12th century when the call for armor was at its peak. Significant aspects of this armor were designed for cavalry archers. 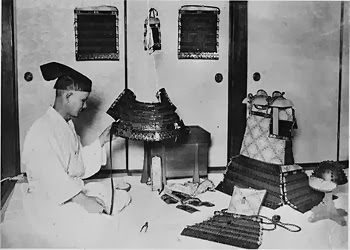 The box shaped ō-yoroi was heavy and did not allow as much movement or flexibility as its counterpart the dō-maru, so the armor fell out of favor in the fifteenth century when samurai shifted to mostly infantry tactics. The basic components of the ō-yoroi and other samurai armor are known collectively as the “hei-no-rokugu” or simply “rokugu　六具,” which means six articles of arms. 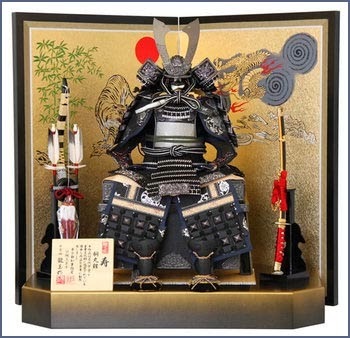 The six major components are the dō　胴 (chest armour), kabuto (helmet), mengu　面具 (facial armour), kote　籠手 (armoured sleeves), sune-ate　脛当 (shin armour), and the hai-date 脛楯 (thigh armour). The ō-yoroi combines plate and scales (kozane) laced together (lamellar). One specific advance over earlier armors is that the kozane of ō-yoroi are first laced together and then covered with lacquer, which enhances resistance to corrosion. The dō of the ō-yoroi is unique from later models because it is composed of two separate parts instead of one piece with an opening on the side or back of the dō to allow the samurai to put on the armor. The color, design, and material of the lacing identified the clan of the warrior. The clans were also identified by the designs painted on the armor. Many of the clans used symbols as a crest, such as cherry blossoms or depictions of deities. 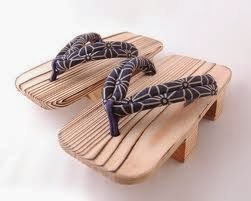 The color and design of lacing the plates together, odoshi, was a system used for identification on the field. There were many different color combinations that identified warriors from a distance. There are different schools in Nara, Kishu (Wakayama), Kyoto and other regions. 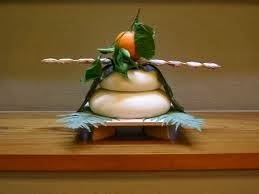 Samurai families used to decorate a yoroi in the tokonoma alcove and place the mochi in front of them.
. yoroi mochi 鎧餅 "armor rice cake" .
. Seafood for Autumn . Tango no sekku 端午の節句 "Boy's Festival"
a traditional Japanese event observed on May 5th as a celebration for boys' talisman and health. Families including boys observe it, displaying yoroi kabuto (an armor), gogatsu ningyoo (dolls for the Boys' Festival), or koinobori (carp-shaped streamers). Although this tradition has continued to this day, after World War May 5th started to be called "children's day". It is observed as a holiday recognizing children's (boys and girls) happiness.
. WKD : Seasonal festival in the fifth lunar month . kabuto ningyoo かぶと人形 "helmet decorations"
. moyogi, moegi 萌葱 a kind of leek .
. WKD : kunpuu　薫風、kaze kaoru　風薫 scented breeze . The cut marker KANA is at the end of line 3. I reversed the word order for more natural English. of the armour plate . . .
. WKD : harusame 春雨 spring rain . these wakame kelp . . .
. WKD : wakame, 若布, 和布 kelp . 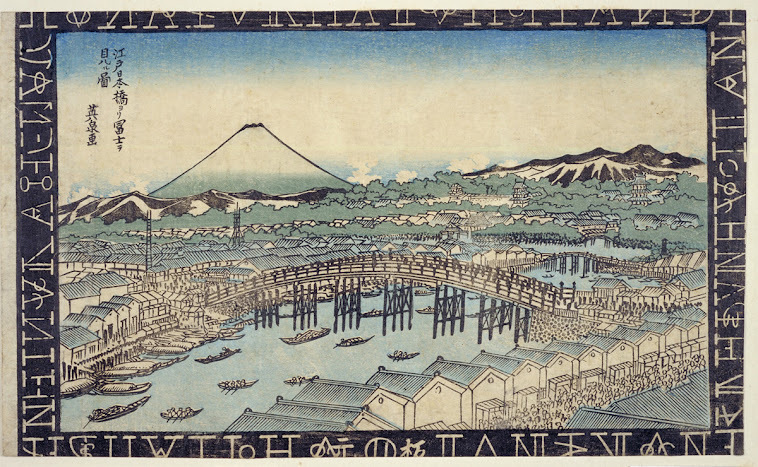 a large river . . .
. Buson and kawa　川　river, rivers . ami 綱, lit. "a net", is a prostitute on Modoribashi, Kyoto 京都戻橋.
. WKD : zukin 頭巾 hood .
. Personification, gijinka　擬人化 . The word aware used in the hokku by Basho (and Buson) is difficult to translate and has a slightly different nuance in each poem.
. aware 哀れ and Matsuo Basho .
. choochoo　蝶 and Chuang Tzu .
. WKD : nameshi 菜飯 "cooked rice with leaves" .
. WKD : geta 下駄 wooden sandals . If the thong of the sandals is too loose, it is hard to walk in them.
. takiguchi ni too o yobu koe ya haru no ame .
. WKD : haru 春 spring .
. Buson : harusame 春雨 spring rain . and then it's over . . .
. shiraume ni akuru yo bakari to nari ni keri - - - shira-ume 白梅　.
. yuku haru ya Yokawa e nobori imo no kami .
. Yosa Buson - Spring Poems Collection . In the Heian period (794~1192) nobility used an ox-drawn carriage as a meansof transportation. 'Dosha no kimi' is a lady riding together with a court noble on the same ox-drawn carriage.
. harusame ya doosha no kimi ga sasamegoto . He had taken part in a poetry meeting but his poem had not been elected by the judge or judges. uta no nushi - the owner of the poem, is a humourous take on himself. senja 撰者 "selector", one who elects a poem or runs a competition, an editor of a magazine. The main word is KAKI, read ..GAKI in compound words.
. kamigaki 神垣 fence of a shrine . Also read en; also called kakine 垣根. A generic term for a fence, garden precinct wall, or partition. Some varieties of bamboo take 竹, Japanese bush clover hagi 萩, brush kanboku 潅木, or azalea tsutsuji 躑躅 are used for hedges *ikegaki 生垣. 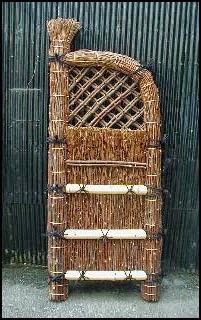 If the fencing material is cut and dried it is referred to as dead material shinigaki 死垣, and can include such things as embedded bamboo posts hottate-no-take 掘立の竹, posts with bark, or bamboo stake and bamboo reeds takeho 竹穂, as for example at Katsura Rikyuu 桂離宮 in Kyoto, specifically known as katsuragaki 桂垣. Long fences are known as *oogaki 大垣 and short fences as *sodegaki 袖垣. Light fences used to divide a garden are called shikirigaki 仕切垣. A type of hedge made of trees, bamboo or other living plants planted in a row and trimmed so as to form a fence. Ikegaki (called ikekigaki 生木垣 or living tree fence in Edo period) are different than itagaki 板垣 (board fences), *ishigaki 石垣 (stone fences), *takegaki 竹垣 (bamboo fences) and other types of shinigaki 死垣 (dead fences). When composed of thorn bushes they are called ibaragaki 茨垣, when made of bamboo, sasagaki 笹垣, and when created with several kinds of tree, called *mazegaki 交垣. 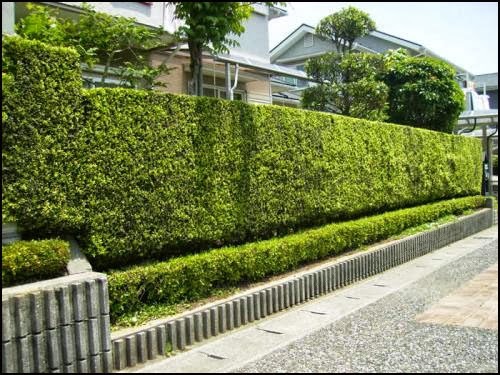 A large clipped hedge or ookarikomi 大刈込 may be used to block out unwanted views *dankei 断景. Ikegaki around houses often serve as windbreaks, while their use between different people's land serves as a property marker. Because of the ancient belief that a god kami 神, resided in evergreen plants himorogi 神籬, ikegaki were often used in shrines and temples to divide space. Evergreens such as Japanese cypress hinoki 桧, Chinese black pine maki 槇 and sakaki 榊 are most frequently employed, although deciduous trees may be used. For protective hedges, thorn bushes are effective, while the dense leaves of Japanese azaleas, satsuki さつき and tsutsuji 躑躅 make them effective when used to block unwanted views. A narrow fence which may serve to screen off some garden element or may be completely ornamental. Commonly found in tea gardens *roji 露路, sodegaki are attached at right angle to the edge of a building. They are generally about two meters high and a meter across. The fence is named for its proportions which resemble those of a kimono 着物 sleeve. Varieties of sodegaki include *chasengaki 茶筅垣, *ensouhishi sodegaki 円窓菱袖垣, *teppoogaki 鉄砲垣, *nozokigaki 覗垣 and *yaegaki 八重垣 as well as yoroigaki 鎧垣 (armor-pattern fence), *uguisugaki 鶯垣, to name just a few of the many variations. Sodegaki are contrasted with functional continuous fences, *oogaki 大垣. They are grown in hot houses, to provide strawberries for the Japanese christmas cake. made from the leaves of living bamboo.
. ukogi うこぎ　/ 五加木 kind of aralia tree . It helps protect the property from fire and is used in small fishing villages, especially in Iwaishima island in Yamaguchi. . . Japanese Haiku with KAKINE hedge . .
A type of simple wooden fence. In 1711 a Korean mission traveling from Ootsu 大津 to Edo attracted so much attention that the government ordered people to erect fences along the road on which the Koreans passed. 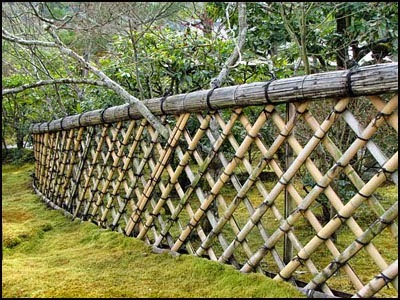 These fences were made with pieces of uncut bamboo tied on intersecting diagonals between two or three cross bars of split bamboo. Often the projecting bamboo at the top is cut to create a sharp edge.
. Yaraicho 矢来町 - "Palisade quarter" in Edo .
. WKD : Fences and Hedges in Kenya . Written in 1690 元禄3年春. Basho stayed with his disciple from Iga, Saboku 乍木. 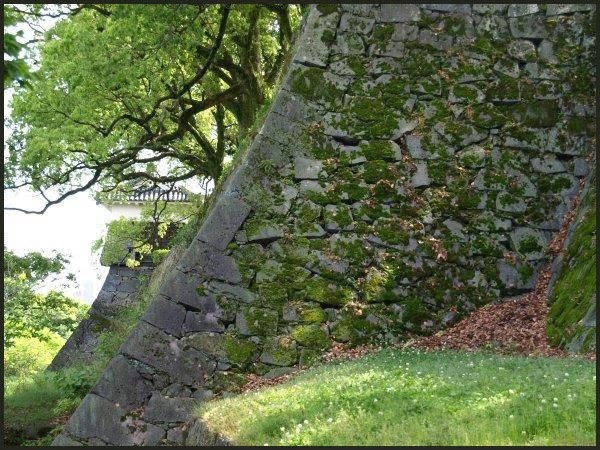 The wall between the homes of Saboku and his neighbour might have been quite tall.
. - choo, chō 蝶 butterfly - and Basho .
. kiri no ki ni uzura naku naru hei no uchi .
. yoku mireba nazuna hana saku kakine kana . The prefatory note derives from a historical event in old China. 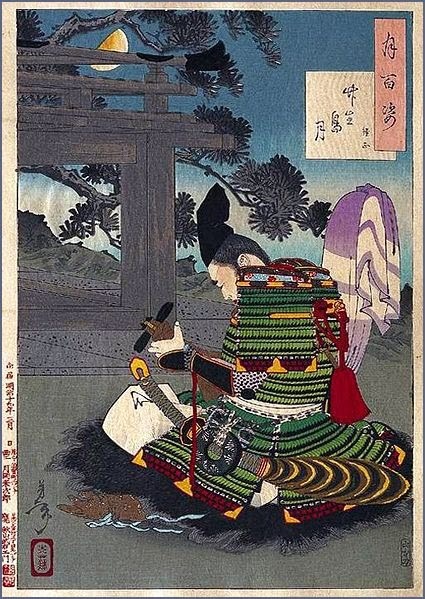 In the Haiku the Poet replaces a 'koto' with a 'samisen'. Prof. Tsutomu Ogata comments that 'he' may have walked by her house very often, hoping to see her; but probably in vain . Anyway, so much time has passed and shepherds' purses are now blooming in the hedge of her house. Little as they are, they look so fresh and vivid. For so much waste of dear time, the white flowers may give him a new hope and he will surely regain strength and try his best to win her heart. Mr. Takahashi says that we associate a white little flower with a pretty beloved girl. 'He' in the Haiku is not necessarily the Poet himself. Here is clearly read a man's strong devoted love for the girl in his heart. 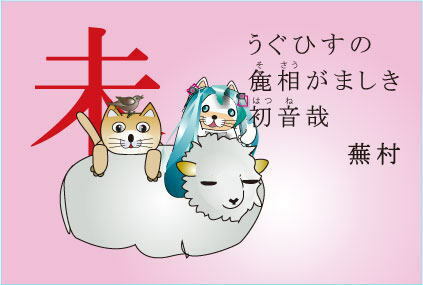 This haiku is difficult to translate because the common name for shepherd's purse in Japanese is 'shamisen grass' which alludes to the three stringed instrument that is still popular in Japan today. that alludes to an episode in the life of the Chinese poet Sima Xiangru that is recorded 'Shiki' (Records of the Grand Historian), a book that has biographies of famous people during the Han Dynasty in China. Xiangru was introduced to the beautiful daughter of a wealthy family who was recently widowed, and he when played a song on a zither in admiration of her beautiful she fell in love with him and they later eloped against her father's wishes. 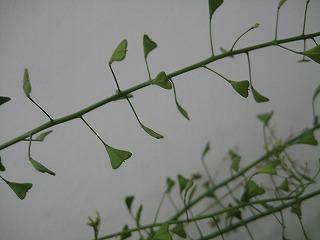 The reason why it is called 'shamisen grass' is because the way the way the stems of the flowers shake resembles the sound that a shamisen makes, and traditionally children will break off the flowery part of the plant and placing it in one hand will play shamisen by moving it like a plectrum. Commentators note that is recorded that Buson was remembering a lost love around the time he wrote this haiku. The opening phrase 'Imo ga kakine' is very vague and I have kept to the literal translation of it, although you could play around with the articles if you want. Commentators tend to read it as meaning that the women is at the hedge, and that is plausible as well depending on how you want to read what verb is being implied here. I think that the allusion to Xiangru's triumph naturally reads the haiku into being about Buson's childish attempts to win this women's heart. 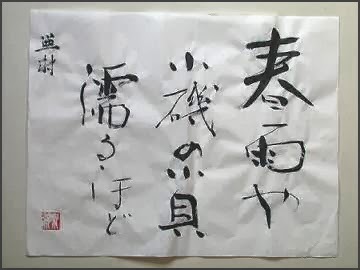 There is another forward that is also attributed to this haiku that translates as 'First folded pocket paper' which no doubt is about Buson passing love poetry on his love, and, hopefully, he didn't use shepherd's purse as the central image to express his affections for this women.This counts as 18.
. shamisengusa 三味線草 "Shamisen plant" - sheperd's purse .
. WKD : tsugiki, tsugi-ki 接木 (つぎき / 接ぎ木) grafting .
. WKD : take no ko 筍　bamboo shoots . yabukooji 藪柑子 (やぶこうじ) Ardisia japonica .
. sasa naki mo temochi-busata no kakine kana . This spring hokku was written toward the end of the 2nd month (late March or early April) of 1820, when Issa was in and around his hometown. The hokku seems to be about a bamboo (probably lattice) fence or a hedge used as a fence that is being visited by a butterfly (or butterflies) and how the fence wows or "knocks out" the visitor with its unexpected attractions for butterflies. The idiom in the second line is used mainly when a person who is normally in a weak position manages to outperform or beat or grab the attention of someone who is in a stronger position. I take this to mean that Issa is reversing common sense in this hokku and looking at the world from the fence's point of view. During the winter and early spring the fence wasn't much to look at, and it had no flowers in bloom, but suddenly, at the end of March, the flowers that twine around the bamboo fence posts begin to unfold with attractive flowers and sweet nectar. If it is a hedge, then the hedge has suddenly put out its own flowers. Until now butterflies have been simply flying over the nondescript fence, ignoring it as if it didn't exist, but today a butterfly finally notices the flowers and can't help but stop and drink for a while. No doubt there will be more visitors from now on. Issa may be sharing in the joy he imagines the ignored fence must somehow be feeling at finally being able to impress and attract a beautiful butterfly. The hokku may also be about how humans, like butterflies, tend to overlook plain-looking things until suddenly something happens to stun them into recognition of how important these almost invisible things actually are.